I've gotten sucked into a reading hole. 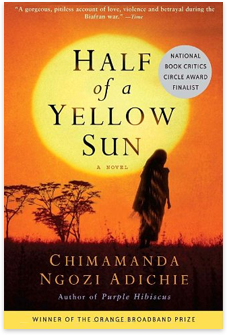 I read The Lowland by Jhumpa Lahiri (soulful and good but depressing), Dead Wake by Erik Larson (somehow disappointed it didn't feel more excitingly like the nonfiction version of watching Titanic) and now I'm chowing down on Half of a Yellow Sun by Chimamanda Ngozi Adichie, which is A. MA. ZING. I'm her biggest fan I think. What are your recent decent reads?